Truly unique, this polished red optic crystal apple is mounted to a clear crystal pedestal base to create a stunning award or personalized gift for a teacher or school administrator. The apple is complete with a gold stem and leaf. The base has ample room to personalize to recognize excellent performance or milestones achieved. This premier crystal piece is packaged in a beautifully lined presentation box for added elegance. 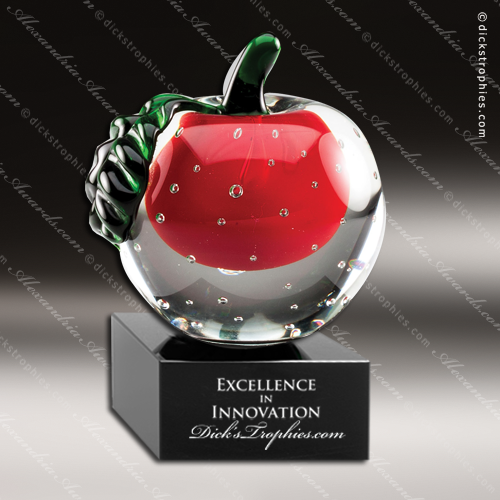 Elegant Crystal Red Apple Encapsulated In Clear Crystal Skin On Black Crystal Base. Personalized with the message of your choice, it will surely become a treasured keepsake for the recipient. Imagine the expression of the person when they see their name on one of these impressive awards. Engraving is laser etched and a velvet lined presentation gift box is included. Elegant Diamond Front Crystal With Red Reflective Bottom 1 3/4" Thick. Personalized with the message of your choice, it will surely become a treasured keepsake for the recipient. Imagine the expression of the person when they see their name on one of these impressive awards. Engraving is laser etched and a velvet lined presentation gift box is included. 4" x 7.75" x 1.75"
The most prestigious Fireman's Maltese Crystal Cross Trophy Award. Personalized with the message of your choice, it will surely become a treasured keepsake for the recipient. Imagine the expression of the person when they see their name on one of these impressive awards. Engraving is laser etched and a velvet lined presentation gift box is included. Elegant Crystal Star With Ruby Collar Mounted On Crystal Base. Personalized with the message of your choice, it will surely become a treasured keepsake for the recipient. Imagine the expression of the person when they see their name on one of these impressive awards. Engraving is laser etched and a velvet lined presentation gift box is included. Elegant Crystal Red Wave, Fan, or Sail Trophy Award. Personalized with the message of your choice, it will surely become a treasured keepsake for the recipient. Imagine the expression of the person when they see their name on one of these impressive awards. Engraving is laser etched and a velvet lined presentation gift box is included. Pure K9 premium optic crystal award with a cone shaped tower. The tower is slightly rounded and sits on a red connector that is attached to a clear round base. Very modern design that will sure to stand out at the award ceremony. Pure K9 premium optic crystal award with a beautiful curve. A three dimensional red color accented crystal is added in the front.